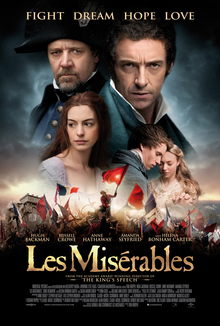 Sarah and I had the opportunity to see the film of Les Misérables today. We put Joseph down for a nap and left him in the hands of the baby sitter as we took the opportunity for an afternoon date. As a little background I have read the novel of Les Misérables three times and I have seen the Broadway musical on VHS/DVD numerous times. I also own the CD of the original Broadway cast and I listen to it on occasion. I am a fan of the story as portrayed in the book and musical but I don’t consider myself an art critic… by a long shot. Prior to the movie I watched several trailers on the making of the film and some theatrical trailers. If you have not seen the International trailer, I highly recommend it as it will give you an honest feel for the film. The film used a unique live filming technique of acting and singing. In a traditional film musical the performers independently record singing and combine it into the acting. In this film they recording the singing while the actors were performing the part. If you are interested in the technique you can see a video about it on YouTube. I feel this technique made the music less polished but injected a large amount of raw emotion into the actors music. So if you are a music lover watching this film, come prepared for music that is more raw than the Broadway Musical. If you are a fan of the novel and are unfamiliar with the musical remember this film is based on the musical and is not intended to be a faithful retelling of novel. The novel is well over a thousand pages long and I feel you would need a mini series to give it justice. What the film misses in story I feel it makes up in emotion communicated through the music and acting. The anguish of Fantine leaps through the screen at you and left most of the audience I was with in tears. If you are completely unfamiliar with the book and musical… you will find this film difficult to follow. A person to my right kept whispering explaining things to her friend. Don’t be that person. Please at least read the synopsis on Wikipedia of the musical so you have an idea of what to expect. You won’t be cheating, this is one movie that requires some preparation to completely enjoy. I’ll now give a few words on some of the cast. Need someone to play a pompous puffed up jerk? Somehow Russel Crowe seems to fit that spot very well. Hugh Jackmans singing comes off as rough on occasion but it warms up as he works through the array of emotions he is trying to convey. If Anne Hathaway doesn’t bring a tear to your eye, you might be a sociopath. Helena Bonham Carter and Sacha Baron Cohen act well as a comedic break and will surprise much of the audience with some previously unexposed singing skills. I was also extremely impressed with the child actors of Cosette and Gavroche. Isabelle Allen and Daniel Huttlestone were both terrific as young actors in those parts. So in conclusion, I will say that I enjoyed the film and I believe most people will… that come with the correct expectations. Don’t come expecting a complete retelling of the novel or a polished version of the musical. Expect raw emotional performances that will leave you reeling. I would also give a warning that it might not be the best film for young children. Not just for the reason that the whole film is composed of singing but also that the Thénardiers have some parts that would be considered a little crude. Nothing too bad by today’s standards but it is deserving of the PG-13 rating.